My wife and I were planning a trip to Sayulita, a great little beach town just north of Puerto Vallarta, and she suggested I buy some small speakers for the trip. 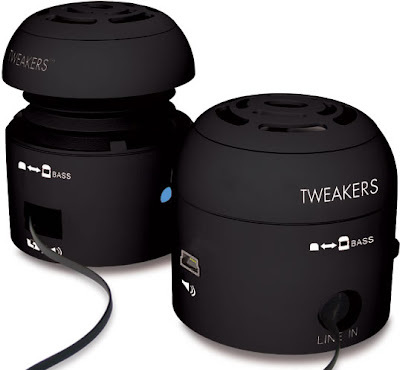 After doing some research and asking for advice from friends, I decided on Tweakers Mini-Boom Speakers for iPod, MP3 players and laptops . These speakers put out great sound for their size, last long and are super compact. You can't beat the price, either -- about $25 on Amazon. Give it a twist and the top portion expands, giving you extra air space which brings out the bass. The expansion chamber has built-in LED lights that light up when you turn on the speakers. With built in lithium batteries, you can have hours and hours of listening. And with the built-in retractable audio and charge cables, there are no extra cables to bring around and no cable mess. When you need to charge your tweakers, just pull the charge cable out, and connect it to a mini USB, or use the included USB charge adapter to connect to a USB port. Btw, on our trip I ended up using these speakers with my iPod Touch and my Droid X.